A veneer is a thin outer layer that is bonded to a thicker inner core. Wood veneers are typically made using a hardwood layer, about 1/32” in thickness, which can be bonded to another type of wood or other solid core. This technique allows builders to create beautiful furniture and wallcoverings for a more affordable cost. Unlike laminate, which is a synthetic print material, wood veneer is a natural wood product that ultimately minimizes waste and maximizes the value of a piece of wood. Each tree is unique, and each type of wood has a singular beauty that cannot be duplicated anywhere else. Unlike melamine, laminate or other artificial materials, the real wood of veneer has a rich, warm feel that is brought alive through its surroundings. As the light and decor of a room are changed, the look of the wood can also change from warm and welcoming to cool and sophisticated. Veneer is ideal for furniture but can also be used for cabinets, doors, ceilings, parquet flooring and rich, luxurious wallcoverings to create a fresh new look for offices, healthcare facilities, schools, public spaces, commercial facilities and more. When shopping for wood paneling, wall coverings or furnishings, specify wood veneer rather than laminate to ensure the very best in not just appearance but also quality. 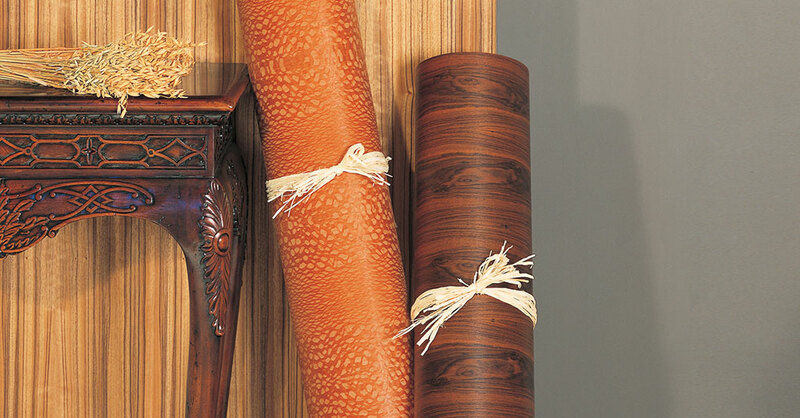 Natural wood veneer also offers unparalleled versatility. It can be repaired and renovated just like solid wood and can be sanded, stained or even painted. It wears hard and offers lasting visual appeal while offering greater sustainability than solid wood pieces. In fact, Jacaranda, Inc. offers a patented process for crafting wood veneers that can boost the yield of a single log by about 300 percent. Jacaranda, Inc. SanFoot wood veneer wallcoverings are available in an extensive range of AA architectural-grade species, colors and cuts, all crafted from real woods featuring rich tones, vibrant colors and eye-catching patterns. Each is Class A fire rated. Installation of wood veneer wallcoverings requires no special tools or techniques and is comparable to applying vinyl wall coverings. Each sheet is prefinished with a lustrous sheen, but additional finishes and stains are available for you to make your final look completely your own. With flexible construction, the veneer panels can be curved and contoured for flawlessly customized results. When we specify wood veneer, we specify quality.